Surina Skallagrimson once created a school of fish, but at the start, most of them were pretty damn dumb. Some of them would wander off and get totally lost, for example, while others were undone by the fundamental laws of Newtonian motion, and simply crapped out in mid swim. So she did the most obvious thing: she killed them all off, pretty much. The ones that were just a tad less stupid than a box of rocks she spared, and replenished the rest that she didn’t. These she sent back to swimming, and the cycle began again. To all the failed fish, death; to the few that showed potential, a chance to join a new generation of the species. Repeat this process a few hundreds times, and you really start to get somewhere. “What you see here is the result of a year’s development,” Surina announces to me from the bottom of the ocean, while her new brood of orange and red clown fish (or, Amphiprion ocellaris) toodle around her. When she began, Surina Skallagrimson initially planned to just create sea life that would populate the coasts and lakes of lands owned by Amazon Nation, the group in which she is Queen. But the trouble with them moving in a school, she found, was that they’d often bang their little fishy heads into each other. At this point, the role of natural selection is embodied by the bracelet on Surina’s wrist. Some other fish do meet their fate through natural selection, of a kind. 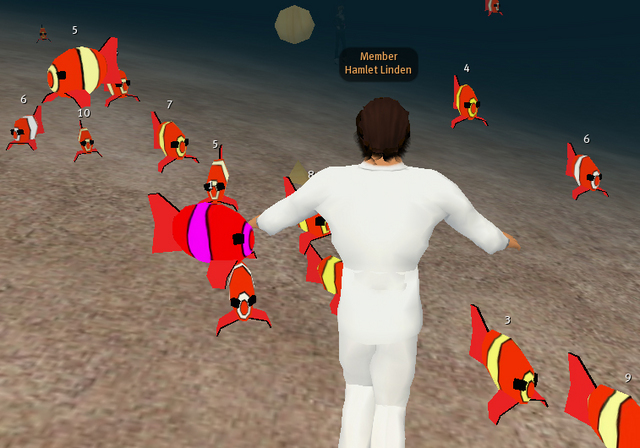 “[There are fish] that die off due to sim physics problems or swimming off world,” she tells me. Free from the threat of disease or climate change, in other words, one of the greatest threats is a fish’s data slipping off the server. As for death by physics, that happens when the world’s Havok-powered system is unable to keep up with so many fish moving in so many different directions. 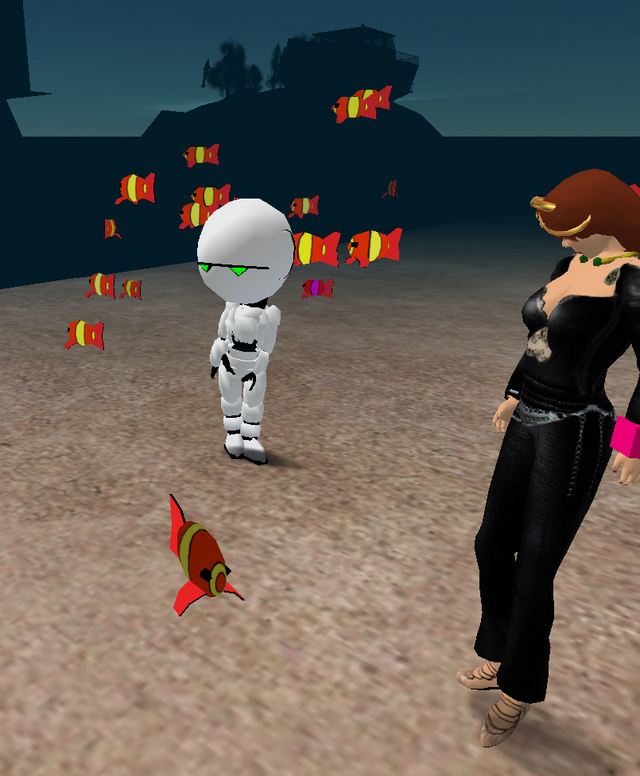 “Rather than writing collision detection,” Surina explains, “I use the built-in physics. The fish are physical; you give them a push, they keep moving. The script within the fish has to keep up with those external changes and if the sim slows down, the fish don't respond fast enough.” And a fish without physics to propel it tends to do the artificial life version of going belly up. But Surina is already introducing more genuine forms of natural selection, too. “Let me add a predator for you,” she says, grinning. And a larger, black and emerald fish suddenly comes barreling at her school of clown fish, which recede and divide at its approach. Within a week after our first demo, Surina Skallagrimson has added food and breeding. “[T]he more they eat, the more they breed. Take away the food and they starve,” she announces cheerily. A food dispenser release a “pellet” of food (an un-textured primitive, actually), and depending on how hungry a nearby fish is (on a scale of 1-10), they’ll be attracted to the food. “The first fish to touch (eat) gets the food and the prim dies.” Fishes that don’t feed in time, die; fishes that do, reproduce through simple cloning. But Surina Skallagrimson’s ultimate goal is to remove herself from the process entirely, and let it follow its own course.